Hellenic College is committed to diversity and welcomes applicants from all backgrounds and all corners of the globe. Qualified first-year and transfer students are admitted on a rolling basis for Fall and Spring enrollment. Please contact us even if you have missed one of the deadlines listed below—we will be happy to work with you! If you have been home-schooled, please submit either a notarized transcript or a state-approved letter that indicates that the completion of the home-school program is equivalent to a high school diploma. All supplemental forms may be emailed or faxed to the Office of Admissions with the exception of official transcripts and test scores, which must be sent directly to HCHC from the original institution. Once application materials are submitted to Hellenic College, they become the permanent possession of Hellenic College and may not be returned to the applicant. *Hellenic College requires a minimum score of 80 on the Test of English as a Foreign Language (TOEFL) or a minimum score of 6.5 on the International English Language Test System (IELTS) examination. While admission to Hellenic College is based on many factors, students wishing to transfer credit from regionally accredited colleges must normally have a 2.5 cumulative GPA in their previous academic work. Students may transfer up to 60 credits, in courses with a grade of C or higher, from other accredited colleges. Normally, credit is granted for each course that is equivalent to a corresponding course at Hellenic College, provided the grade is C or above. The Registrar, in conjunction with the Program Chair, will determine whether courses may be counted for credit within a student’s program and will grant all credit deemed appropriate. Transfer credit requiring additional consideration will be reviewed by the Degree, Policies, and Procedures Committee (DPCC) in conjunction with the Dean. Prior to enrollment, students may request a tentative degree audit provided by the Office of Admissions. Once enrolled, the student will receive a final degree audit provided by the Registrar’s Office. Semester of Faith provides a wonderful opportunity for short-term study at Hellenic College. 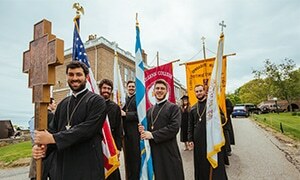 Students take college-level courses that enrich their spiritual lives and help them complete their bachelor’s degrees while living in a very special Orthodox Christian community. In addition to courses on religion, Semester of Faith participants can take liberal arts courses in a wide range of subjects, from literature and history to science and business. Most colleges and universities have transient enrollment policies regarding which courses from other schools can be transferred back. Depending on your major, most credits from Hellenic College should transfer back to your home institution, but be sure to check with your own advisor and/or registrar before applying to Hellenic College for a Semester of Faith to maximize the credits you can transfer. 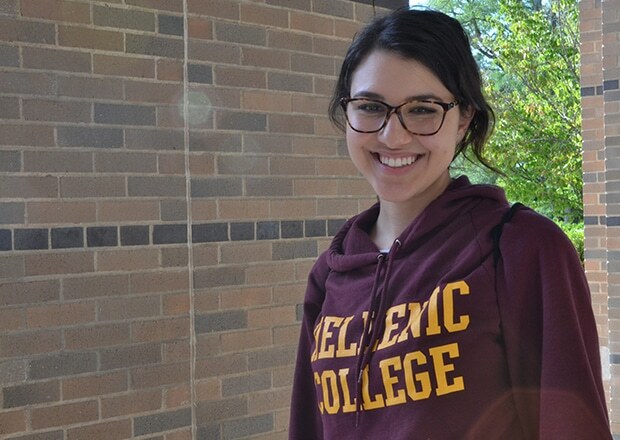 The Hellenic College Honors Program allows highly motivated students to go beyond formal coursework in their majors to develop skills that deepen their understanding of that field of study in the context of other disciplines. Central to the Honors Program are yearly seminars devoted to interdisciplinary study of major themes, lives, or events. Faculty and students also participate in collaborative learning experiences such as inviting speakers to campus, showcasing students’ work, and getting together socially. The capstone of the Honors curriculum is the senior thesis, an extended research project prepared under the guidance of a faculty mentor. Graduate and professional schools, as well as prospective employers, recognize the thesis as a clear indication of a student’s ability to do independent work at an advanced level. Honors students complete nine credits by taking the three Honors seminars and earn another six credits for a completed thesis. They must maintain a cumulative B+ average in their Honors courses and all other coursework. Their theses must also be of B+ or higher quality. To be admitted to the Honors Program, students may be recommended by the Admissions Committee or faculty members, but may also apply directly through the Admissions Office. All applicants must have a GPA of at least 3.5. Incoming freshmen, as well as currently enrolled freshmen and sophomores, are eligible to apply.